There are many user research approaches we can choose from when conducting usability studies. This week, let us take a closer look at the six most often used user research techniques and see what makes them so popular. I find it amazing how often very similar problems require notably different approaches in order to be solved successfully. So far I’ve found this holds true for just about anything in life and, by extension, usability research as well. Usability Testing is a research technique which helps us evaluate a product or service by testing it on its representative users. In order to eliminate outside disturbances and allow the researcher to better take notes of the entire process, it is preferably done in a controlled environment such as a lab, but can also be done remotely or in a room where we can ensure no disturbances or distractions. Often it is filmed or videotaped, but doing so is not a requirement as long as someone is closely observing the user and taking notes. The goal of Usability Testing is to identify any usability problems, collect qualitative and quantitative data and to determine the participants’ satisfaction level with the product or service we are testing. In order to achieve that, we measure various factors such as time needed to perform tasks, error and success rates, preference for alternative solutions and, of course, users’ subjective level of satisfaction. Sometimes also called “multivariate testing,” “live testing,” or “bucket testing”, it is perhaps the most straightforward form of testing. A/B Testing is merely comparing the effectiveness of two different versions of the same design or product by launching them both under similar circumstances. 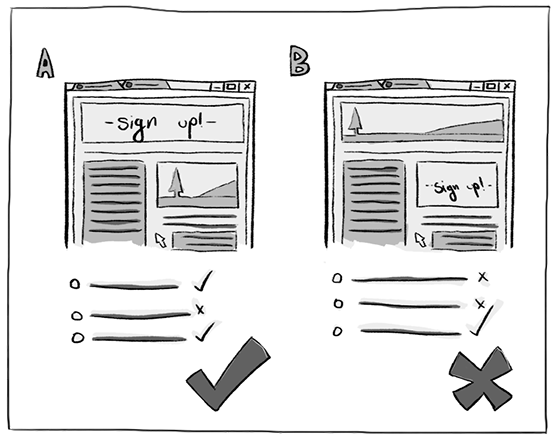 In the context of web pages, A/B Testing would mean launching two different versions of the same web site at the same time. The goal here is to see which version of the web page (A or B, with A being the control version and B being the variation) ends up giving us a higher conversion rate. A Quantitative Survey is a survey or a questionnaire distributed to a large number of participants; usually a representative sample of our target market, in order to hear their opinions strictly on a subject we are testing and need input on. It is important that the questions in this type of a survey are closed, meaning that the respondents are choosing from a specific selection of answers and are not given an opportunity to expand or elaborate on their responses. Used as tools for business and market research, Web Analytics help us assess and improve the effectiveness of a website. Web Analytics are done by collecting, measuring, analysing and reporting on various web data obtained by web servers, tracking cookies and so on. By obtaining data from a large number of users, we can highlight patterns in navigation and user types as well as focus on answering specific questions such as “How many people visited the site?”, “How many of these visits were unique visitors?”, “How did they come to the site?”, “How long did they stay and how much time did they spend on each particular part of our site?”, “Which keywords did they use in their search which brought them to the site?”, “What keywords did they search with on the sites’ search engine?”, “How does the day of the week or a time of a day affect user habits?” and many, many more. When performing web analytics we use various software to collect a large amount of data, but it is up to a Usability Specialist to interpret the data and come to concrete conclusions and ideas on how to utilize the data we’ve collected in order to improve the UX. Using a Focus Group, a Usability Specialist will lead a moderated discussion with 4 to 12 participants. 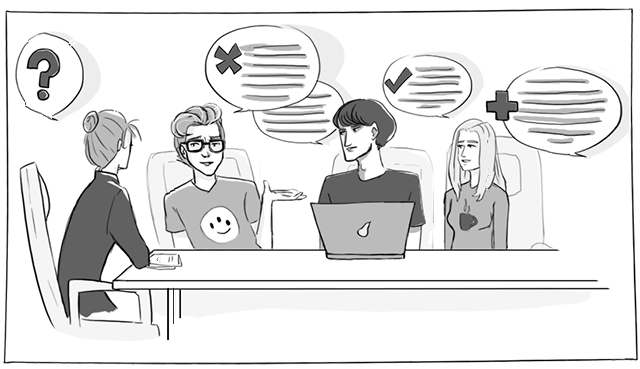 This discussion will be conducted in a controlled environment- just like a Usability Testing session. The goal of a Focus Group is to gain verbal and written feedback through discussion and exercises and to explore preferences (and reasons for those preferences) among different solutions. Although Focus Groups are definitely a powerful tool when it comes to system development they are never used as an only source of usability data. This is because the feedback we receive from Focus Groups is subjective, and, therefore, should be taken with a grain of salt- especially in cases where the users are asked to describe how they perform activities which span many days or weeks. Hence, we do not use Focus Groups to assess interaction styles or design usability, but to discover what the users want from the system they are using. Sometimes what we, the developers, want to give the users isn’t what the users actually need from our websites and apps and this is why Focus Groups are a valuable source of information; they help us align our views with the views and needs of our average user. A Central Location Test (or interview) employs both quantitative and qualitative research techniques, as well as visual techniques such as monitoring the respondents’ eye movements and testing for degree of recall of particular elements of a website, app or a product. In a controlled environment, groups of 15 to 50 people are shown demos or allowed to use products before being interviewed or taking a survey to measure their grasp of the concept, the appeal of various features and the desirability of the product. CLT is the most suitable method for testing concepts, new or modified products or packaging, advertising effectiveness and sensory research. I hope this little rundown through the user research approaches was useful to you. If there is anything in the realm of UX and UI you’d like to read more about, feel free to shoot me your ideas or questions at [email protected]. I’ll be happy to hear from you! Participatory Design: What is it, and what makes it so great?